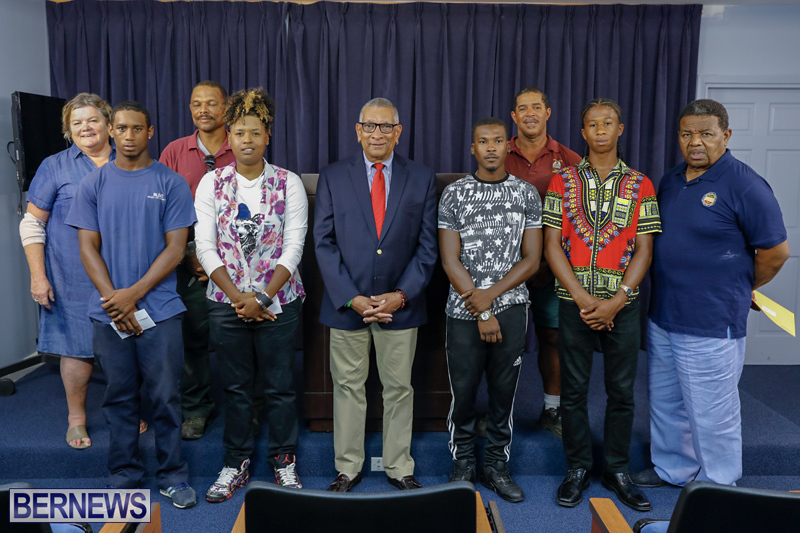 [Updated] Minister of Public Works Lt/Col David Burch is holding a press conference this morning [July 16] to highlight the Skills Development Programme graduates who will be travelling to the UK next week for further training. We will have additional coverage later on and in the meantime the live video of Minister Burch’s press conference is below. Update: Minister Burch highlighted four Bermudians who will be travelling to Bournemouth, UK tomorrow as part of the Skills Development Programme. Shalae Johnson, Leric Lightbourn, Troy Watson, and Kacy Greene will be in UK for the next three and a half weeks and will be exposed to a variety of disciplines to help further improve and develop their skills in the landscape and horticulture field. Minister Burch was joined today by Cindy Young, President of the Garden Club of Bermuda and Collin Simmons, Education Officer of the Bermuda Industrial Union, who presented the four participants with donations on behalf of the BIU. Thank you for joining us this morning as we introduce the four recent graduates of the Skills Development Programme who will be travelling to Bournemouth, England tomorrow evening on what is likely to be the trip of a lifetime. Before doing that however, let me first acknowledge the presence of Mrs. Cindy Young, President of the Garden Club of Bermuda along with Brother Collin Simmons, Education Officer of the Bermuda Industrial Union – they along with the Department of Parks are the principal partners in the Skills Development Programme. To remind the Skills Development Programme goals are to equip young people with skills, knowledge and experience to assist in making them attractive for employment opportunities in both the public and private sectors: it is envisioned that this programme will reduce the likelihood of these young people engaging in anti-social behaviours. Not only does the programme offer structure, training and support, it provides life skills training and opportunities for them to showcase their potential and talent. Originally, when the programme started some 3 years ago it was a volunteer programme for 3 days a week. It has evolved and is now funded by the Bermuda Garden Club and over the last 2 years it has received generous donations from various other sectors of the community. In partnership with the Department of Parks and the Bermuda Industrial Union – young people participate on a voluntary basis and are provided with a stipend at the end of each module so they learn to give something back to their community and also receive a monetary award. For the past 4 cohorts, the Skills Development Programme has developed a curriculum that helps teach life and career skills that are beneficial for successful employment. The hands-on training exposes participants to a higher level of horticulture and boosts their confidence. This innovative training course includes ten modules that includes a module on ‘CPR/First Aid’ along with verbal and hands on assessments, at the end of each module. Participants are also given the tools to assist in life lessons such as how to conduct themselves in an interview, time management, and team work. The participants will be training in the United Kingdom for approximately three and a half weeks and will be exposed to a variety of disciplines that will enable them to further improve and develop their skills in the landscape and horticulture field, only one of them has been to the UK before so I’m sure the others will have an interesting time. On the Bournemouth end Mr. Christopher Colledge, Chairman of Bournemouth Botanical Gardens has been instrumental in facilitating the training in the UK and developing a long term relationship with the Bermuda Department of Parks. Our students will also participate in the annual Exhibition Bournemouth in Bloom while in the UK. Of course none of this would be possible without the incredible support of the Garden Club of Bermuda who are the charity that funds the Skills Development programme, receive donations from other community partners and are sponsoring the Bournemouth training experience. To the participants I encourage you to use your time at Bournemouth Gardens wisely. The training and exposure should be viewed as planting the seeds that will nurture and grow your soft and hard skills that can be used in your future careers. You will be exposed to a different culture, mindset and skills while in Bournemouth. Like the roots of a tree during the rain – soak up all the knowledge and experience that you can. And when you return to Bermuda put those skills and knowledge into practice, whether it be in the private or public sector and don’t be afraid to impart that knowledge and skill to others. It is no secret that the horticulture and landscape industry in Bermuda both in the private and the public sector is always looking for qualified Bermudians who are passionate, trained, skilled and reliable to be employed in that industry. There are a wealth of opportunities available in the horticulture and landscape industry and while it is not for everyone – you all have shown that you have an interest and desire to pursue this course and ideally you have also found your passion which will make this an enjoyable career – not just a job. On behalf of the Ministry of Public Works and particularly the Department of Parks may I say thank you again to the Garden Club of Bermuda for sponsoring this initiative and to the Bermuda Industrial Union for your support. Let me also take this opportunity to publically thank Mr. Roger Parris and Mr. Sam Santucci the facilitators of this programme who execute it with dedication, compassion and love of both the work and the participants. I‘d like to now invite Mrs. Young, President of the Garden Club of Bermuda to say a few words followed by Brother Collin Simmons and then by the graduates. Thank you for the work you are doing for the future of this island. Great job! Could have been done here in Bermuda. ‘three and a half weeks’? Jeff Sousa is no threat; let him help out. What about our own agriculture department. Lol. You are such a kid. Sad that you can’t even congratulate the students. And still we rise. Keep your head to the sky young people. These haters are on there way out. This “awesome” government certainly knows how to look after one particular segment of our multi racial population, The hypocrisy is stagggering. Jealousy on your part does nothing to me Com Numb. I am still proud of this AWESOME GOVERNMENT!!!! Great Job Leric! Glad you dressed up you set an example to de youth! Great job Lt/Col Burch. Yuh de man! Because you are synical or a sociopath?? ?